Tech Times reports on the latest innovations and developments taking place in technology, science and health industries and the challenges they face every day. We analyze how businesses and technology intersect, and influence, and impact different markets and industries to bring about cultural transformation in this increasingly interconnected world. We publish informative and insightful news, reviews, analyses and opinion pieces on a wide spectrum of topics, bringing you the the latest in technological innovation as well as scientific and medical breakthroughs. Our passionate editorial team is committed to empowering readers by demystifying the developments in technology, science, health, and more, and reporting on them in an easy-to-read-and-understand format. We cover both fun and important topics. We embrace the nerdy details. Tech Times is owned and managed by Tech Times LLC, a digital media company headquartered in the heart of downtown New York City. 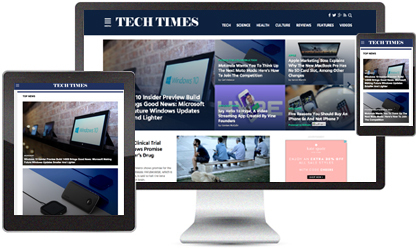 Tech Times editorial team is comprised of passionate and consummate editors and writers who are based in the US, Europe, and Asia. The team works round the clock to deliver news, reviews, reports, opinions, and analyses, on technology, science and health innovations that are shaping our world.